By Katherine Knott on Friday, November 20th, 2015 at 11:32 a.m. Shortly after Friday’s deadly terrorist attacks in Paris, several articles from conservative blogs made the rounds on social media reporting that protesters from MU were angry. The protesters were reported to be upset that the attacks directed the national spotlight away from race relations and recent events at MU. MU has been at the center of tensions related to race relations for weeks. Demonstrations, a student’s hunger strike and a walkout by the football team all led to the resignations of UM System President Tim Wolfe and MU Chancellor R. Bowen Loftin. The events at MU dominated local news coverage and made national headlines. Then, late Friday, terrorist attacks killed 129 people in Paris. Breitbart News, the Daily Caller, the Washington Times and other outlets ran stories saying "Mizzou campus activists" are angry that so much attention was being paid to the attacks in Paris, not the incidents in Missouri. A website called the Right Scoop headlined its story: "Un-effing believable! 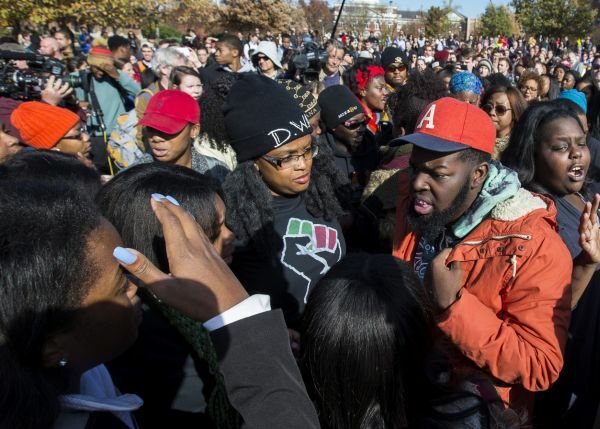 Mizzou protesters are angry Paris terror attacks stole their media spotlight!!!" On Saturday, MU officials released a statement disputing those reports. A statement posted on the missouri.edu website said the people issuing the tweets weren’t a part of the MU community. "Social media posts expressing dismay that the tragedy in Paris is diverting media attention from events at the University of Missouri are being made by individuals from outside the Mizzou community in an attempt to create conflict," the university said. "Our hearts go out to the citizens of Paris and all those affected by the tragic events of last night. While our community has faced difficulties over the past week, we express our sincere sympathy to those who have been affected by the events in Paris and remain committed to making Mizzou stronger and more inclusive." We reached out to Brietbart’s Milo Yiannopoulos to see whether he verified the identities of those who issued the tweets. He said he reached out to many of the authors of those tweets via direct message. "Several of the tweeters whose messages I quoted identified themselves via DM to me as Mizzou protesters," he said in a direct message. But just because those account holders claimed they were from Mizzou doesn’t mean they were. The different posts about the protesters had four Twitter accounts in common: @_kyrahardy, @ilovethisnigga, @NeonElectricity and @RheaBans. We dug into those. @_kyrahardy tweeted: "Interesting how the news reports are covering the Paris terrorist but said nothing about the terrorist attack at #Mizzou." The first tweet on this account about MU appeared Nov. 11, a full 10 days after the campout on the Carnahan Quad started. The author’s name doesn’t appear in the Missouri student directory, though it should be noted that students may opt out of the directory. However, a Facebook page belonging to a woman with the same name and likeness belongs to a Kyra Hardy affiliated with Austin Peay University. @ilovethisnigga tweeted: "Not taking away from Paris we love yall but we have a terrorist in USA Called KKK #Mizzou. Gov got work to do." Her Twitter account doesn’t contain a name, so a directory search couldn’t verify whether she’s an MU student. Her location in her Twitter bio is listed as Avocado Heights, California, in Los Angeles County. A look back through her feed shows that her first tweet mentioning MU was made on Nov. 11. @NeonElectricity tweeted: "Racist white people kill me, you want everyone to have sympathy for YOUR tragedy, but you have none for ours. #GetTheF---OutOFHere #Mizzou." Her account has since been deleted but was accessible via the Internet Wayback Machine. Her Twitter bio read, "Hairstylist/Singer/Songwriter/Aspiring Actress/Art Lover/Creative/Dreamer." Her location is listed as "FL Soon CA." Here’s the last tweet before the account was deleted: "R.I.P. to the people who died in this senseless tragedy & Speedy recovery to the survivors. #Prayers4Paris & I'm standing w/ you #Mizzou." The name was listed on the account was Melanin Monroe. The Missouri student directory contains no listing with the first name of Melanin. There’s one listing for a student with the first name of Monroe, but he has a different Twitter account. @RheaBans tweeted: "We can remember the tragedy in Paris and still remember #Mizzou. We are capable of multitasking. Both situations are equally messed up." That account has since been deleted and was not accessible using other methods. We reached out via direct message to those whose Twitter accounts still existed to ask about their connection to MU, but received no response. None of the Twitter accounts cited have a track record of tweeting about Mizzou prior to this week. They do not reflect the statements of the public face of the Concerned Student 1950 movement. At MU, several protesters with clear connections to the campus demonstrations posted about the Paris attacks. Concerned Student 1950, one of the key groups pushing for change at MU, tweeted: "#PrayersforParis." Graduate student Jonathan Butler, who went on a hunger strike for eight days to remove Wolfe from office, said in a lengthy Facebook status: "So as the world continues to face tragedies, hatred, racism, sexism, etc., every day let us NEVER forget the power of love and NEVER forget the power of community. Love conquers all. Love never fails. Love always wins. #‎InSolidarityWithMizzou#‎PrayForParis#‎PrayForJapan#‎PrayForTheWorld#‎ConcernedStudent1950." Reuben Faloughi, an original member of Concerned Student 1950, tweeted: "Y'all there is so much fight left... Stay woke. #Pray4Paris #Pray4Mizzou #ConcernedStudent1950." Some bloggers and Internet sites posted stories stating that MU protesters were angry that the Paris terrorist attacks stole the spotlight from the controversy at MU. It’s true that some people did tweet their dissatisfaction with the change in coverage. However, the tweets and commenters cited by the bloggers show no evidence of a connection to MU or the Concerned Student 1950 movement. Using the hashtag #Mizzou doesn’t mean those people were camping on Carnahan Quadrangle or even present on campus. Meanwhile, leaders of the Concerned Student 1950 demonstrations and the Legion of Black Collegians have posted statements of sympathy and support for the victims of the Paris attacks, not statements of hate or anger. While it’s impossible to prove beyond a doubt that those who complained about the redirected coverage have no connection to MU, we could find no evidence allowing us to independently verify that these individuals are, in fact, "Mizzou protesters." "Mizzou campus activists" are angry that so much attention was being paid to the attacks in Paris, not the incidents in Missouri.